Gunupur in the Industrial District of Rayagada is a nerve centre for Technical Education..... with many of Odisha’s most reputed Engineering,Diploma Engg., MCA, MBA Pharmacy colleges situated here. An adobe of peace & natural beauty, adorned with the most famous Jagannath Temple. This peaceful town is Lying amidst natural valley and hills and hillocks by the bank of River “Vansadhara”. A fertile land with rich vegetation that produces major share of the states rice and vegetable crop. A semi hill station free from Industrial pollution and communal tension.Gunupur is well connected by both rail and road route. Around 150 buses connect Gunupur directly with Cuttack, Bhubaneswar, Berhampur, Visakhapatnam, Jeypore, Bhawanipatana etc. The Gunupur railway station is connected to PALASA on Chennai - Howrah Main route and to all the north - eastern states through RAYAGADA. 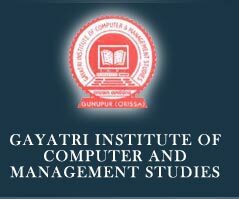 Gayatri Institute of Computer and Management Studies, one of the fastest growing Technical Institute to impart MCA and MBA studies in Southern India. The Institute with eminent faculty and excellent infrastructure invites students from different regions of the country to pursue their study and project work. This institute has been established in the year 1999 under ISA trust in a socially and economically challenged area, spread over 20 acres of land a midst naturally flora and fauna. This area is free from communal tension and industrial pollution. The institute is situated on the Gunupur-Paralakhemundi state high way just 5 km distance from Gunupur in the industrial District of Rayagada. NOC: The Department of Higher Education, Govt. of Orissa has granted NOC vide its letter no 34553/HE Dated 26.07.1999. Approval: The Courses are approved by All India Council for technical education AICTE,Govt. of India. Affiliation: The institute is affiliated to Biju Patnaik University of Technology(BPUT), Rourkela, Odisha. Copyright © 2007-2010 Gayatri Group of Institutions, All rights reserved.